Today, we explore the backstory of the Eternals, analyze the narrative role of villains, unveil a major turning point in War of the Spark, and use the power of the number four to help our opponent discover their deepest psychological truths! First, let's review how the army of Eternals came to be. In the story of Amonkhet and Hour of Devastation, elite initiates faced five Trials to test their strength, virtue, and skill. The stated reward for completing all five Trials was the glorious honor of being slain by the spear of Hazoret, the Fervent and sent on to their reward: a glorious afterlife at the side of the God-Pharaoh. We now know the truth, of course—that the fallen dead were warehoused in Bolas's necropolis, coated in a metallic mineral called lazotep, and animated through necromancy. 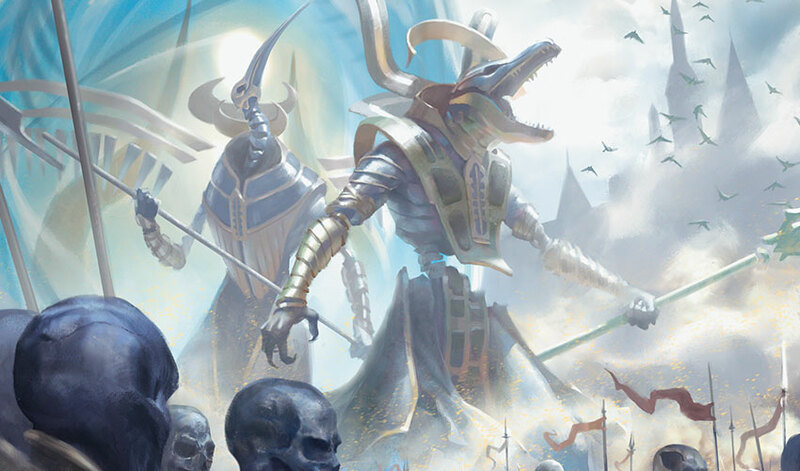 The elite warriors of Naktamun—plus a few fierce animals and other creatures of Amonkhet—became a legion of unstoppable undead we now know as the Dreadhorde. Nicol Bolas had turned the world of Amonkhet into a brutally efficient factory to generate his perfect invasion force—an army with all the strength and skill of the champions of Amonkhet, without the weaknesses of conscience or mercy. But as it turns out, that was not the only form of Eternal that was created. During the Hour of Devastation story, the three gods of destruction laid waste to the city-state of Naktamun and all within it. The merciless Scorpion God hunted down Amonkhet's revered gods, and four of them—Oketra, Kefnet, Bontu, and Rhonas perished. 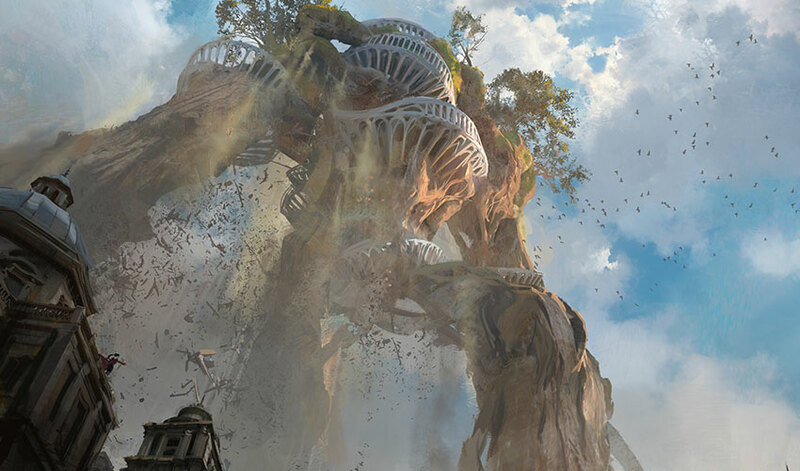 Hazoret managed to escape destruction, but the world's pantheon was shattered, completing Bolas's ruination of the plane. But they didn't just die. 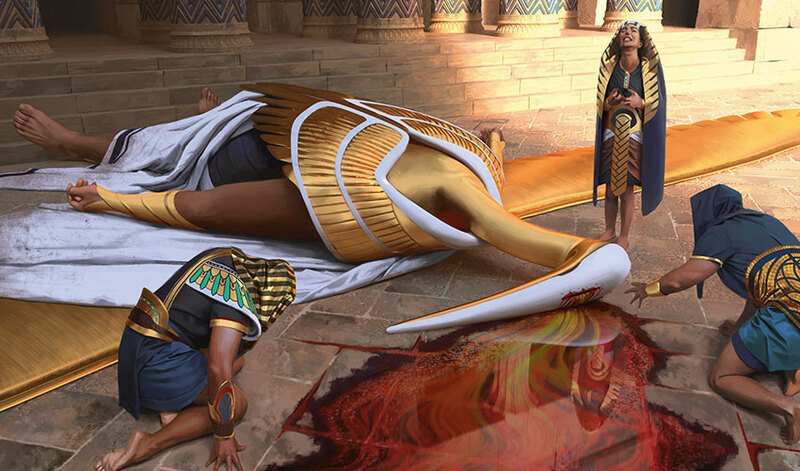 At Bolas's command, the dead gods were hauled away to the God-Pharaoh's necropolis, where viziers performed rituals of dark magic over their bodies, anointing them with lazotep just like the warrior Eternals. The gods were rebuilt to be Nicol Bolas's secret weapons for the impending war on Ravnica, a foursome of divine monstrosities, controlled directly by Bolas himself. And now we see those four God-Eternals step through the Planar Bridge and into Ravnica. Creating the God-Eternals is an act of remarkable cruelty. Why do such a thing? We should ask ourselves at this point, what is a villain's purpose? Why does a story even need a villain? And why does a villain do such horrific things? If you ask me, ultimately the villain exists in the story for one reason: to oppose the protagonist. The villain's job is to hinder, frustrate, and ultimately, transform the protagonist at the end of the story. Well-constructed villains have personal goals and quirks and values, and they strive to make their dreams a reality, of course. Great villains believe they're the hero. But as much as Nicol Bolas likes to think otherwise, the villain—in story structure terms—is not an end in themself. I like to think of a protagonist this way: they're a character struggling at the brink of a new identity. Consciously or not, they're wrestling with a problem that goes so deep into their soul that they won't be able to solve it as the person they are now. A protagonist generally tries to solve their problem using easy, straightforward, near-at-hand methods at first, but those methods always fall short. Think about how many setbacks a protagonist suffers during a story. They try and they fail so many times! And that's because they're trying to hang onto the comforting old conception of who they are. To really solve their problem, they'll need to reach deeper and commit to letting go of their old assumptions, their old plan, their old self. And they need an obstacle that will not budge until they do. The villain is that obstacle. The villain is that force that is so antithetical to the protagonist that they not only come into conflict with each other, they're fundamentally incompatible. The villain's plan is such that it's immune to being solved by the protagonist's current self. The villain will never let the protagonist off the hook; they aren't satisfied with partial commitment, partial transformation, partial growth. So, cruelly, the villain often unleashes their masterstroke right after things seemed to be going well for the protagonist. That brings us to the Dark Night of the Soul. Named after a poem by sixteenth-century Catholic saint San Juan de la Cruz (St. John of the Cross), the Dark Night of the Soul is a term often used to describe a turning point in the story when things get real bad, real fast. It's the punishing, soul-hammering moment when the worst you've suffered suddenly looks like the easiest you'll face. It strips the heroes down to their bare bones. It asks them the hardest questions so we can find the truest answer. And in the War of the Spark previews so far, things have been going okay—almost well—for the heroes. 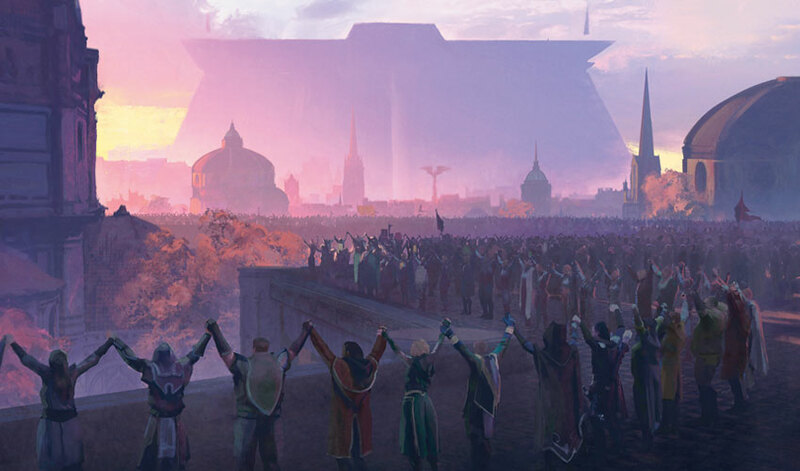 We've seen Ravnicans protesting at Bolas's looming Citadel. We've seen new alliances form between Planeswalkers and Ravnicans, and an exchange of hope and support. Eternals have marched into guild territory, but we saw Nissa animate Vitu-Ghazi, famous guildhall of the Selesnya Conclave, into a massive force for good. But the heroes haven't really reached deep yet. That's easy stuff. Parlor tricks, not personal growth! If we're in the role of the villain here, are we going to let the heroes achieve victory for a few comforting words and feel-good spells? Of course not! Your opponent wants to be the protagonist, so help them out by sending them through their own personal Dark Night of the Soul. Attack them on every axis. Push them to their limits. Deplete them of their every resource, so that they can give up and realize the old assumptions they've been clinging to won't be enough to win the day. For five mana, turn around the game. Destroy a threat. Reclaim a life advantage. Spill the contents of a magical arsenal. Establish or grow your amassed army. All in increments of four. Throw all these fours at your struggling opponent—after all, you're doing them a favor! You'll show the protagonist that their efforts are not enough! You close in. You unleash the secret weapon that you've saved in reserve. You show them that you've been toying with them, that you've been tolerant of their incomplete progress so far, but that playtime is over. Show them that it's time to put up or die. They'll learn their truest truths about themselves! Or, you know, they'll die. Really, you're helping your opponent out. It's painful being the partial hero. Like Hamlet, they're pigeon-livered, and lack gall! Either make them rise up and destroy you, or put them out of their misery. It's your job. 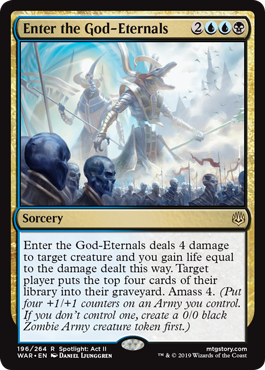 The four magnificent God-Eternals are here, emerging through the Planar Bridge from Amonkhet to serve as Bolas's personal guard and as his go-to secret weapon against the heroes. They're the sign that Bolas has anticipated the heroes' resistance and counter-planning and silly, silly hope—and now they can be your sign that this game is over!